The Solow growth model, also called the neoclassical growth model, was developed by Robert Solow and Trevor Swan in 1956. Robert Solow later received the Nobel Prize in Economics in 1987 for his work on this theory. 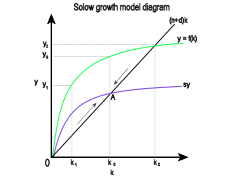 The Solow growth model is an extension of the Harrod-Domar Model. It states that there are three factors: technology, capital accumulation and labour force that drive economic growth. What are the factors affecting economic growth? The Solow growth model believes that a rise in capital accumulation and labour force will increase the economic growth rate, but only temporarily because of diminishing returns. For example, imagine if an economy only has one worker. If you add one more worker, output will increase dramatically. But if the economy has thousands of workers, adding one more worker will not cause output to increase as much. Eventually, the economy will grow at a steady rate, with GDP growing at the same rate as the increase in labour force and productivity. Once the steady-state is reached and the resources in a country are used up, the economic growth rate can only be increased through innovation and improvements in technology. What are the implications of this model? The theory also explains why Germany and Japan, despite losing in the Second World War, managed to grow faster than the US and UK during 1950-1960 period. This is because many capital stocks in those countries were destroyed during the war, so any new addition of capital would have a high return and significantly increase economic development.